It’s called General Finishes Java Gel Stain. I had to buy it online, because they don’t sell it around here. 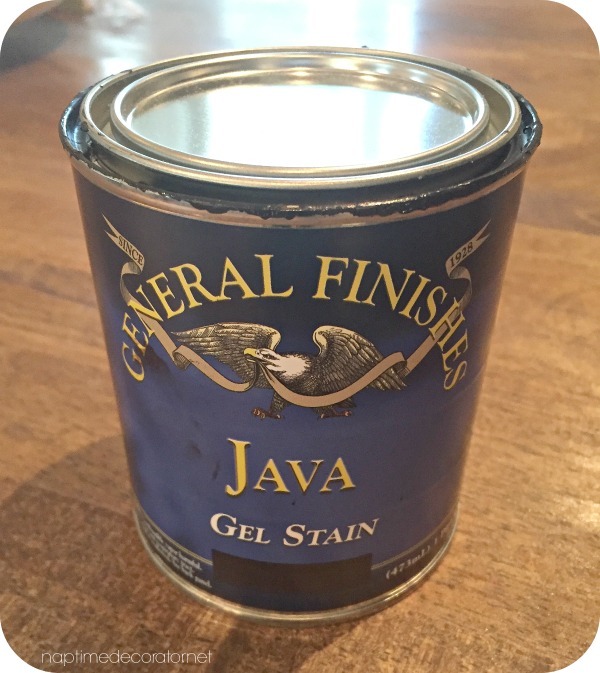 (You can click this link: General Finishes JQ Gel Stain, 1 quart, Java to buy a quart size one!) I’d read about it on the interwebs quite a few times – and even told clients about it when they wanted to redo their oak banisters. It had an awesome reputation as far as ease and application, and I was living with a RED banister over here. Ok, ok, maybe not red red, but red enough that I thought about stripping it down and restaining on a daily basis. Until I read about this gel stain stuff! Barely any time and mess at all, and now I have THIS! Now, we had some SHINY banisters. I was skeptical about this stuff, because I had heard it’s so amazing that you hardly have to do any prep and sanding – but as I said: SHINY. Lots of poly on here. But I just grabbed a piece of sandpaper (150 grit), and spent just a few minutes roughing it up. I took out a small foam brush. 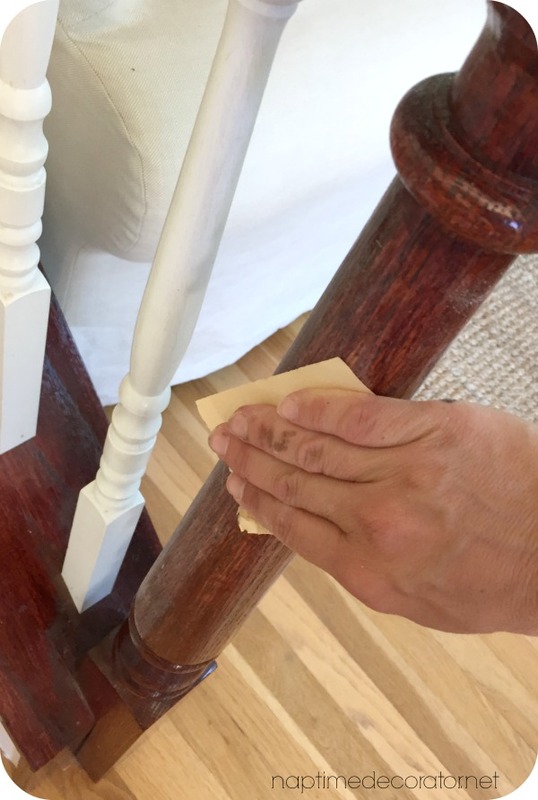 Yes, you should prep your work space, yes, you should tape around your spindles, on the steps, etc, yes, you should wear gloves, yes, you should lay down dropcloths to protect your carpets and floors. You totally should. 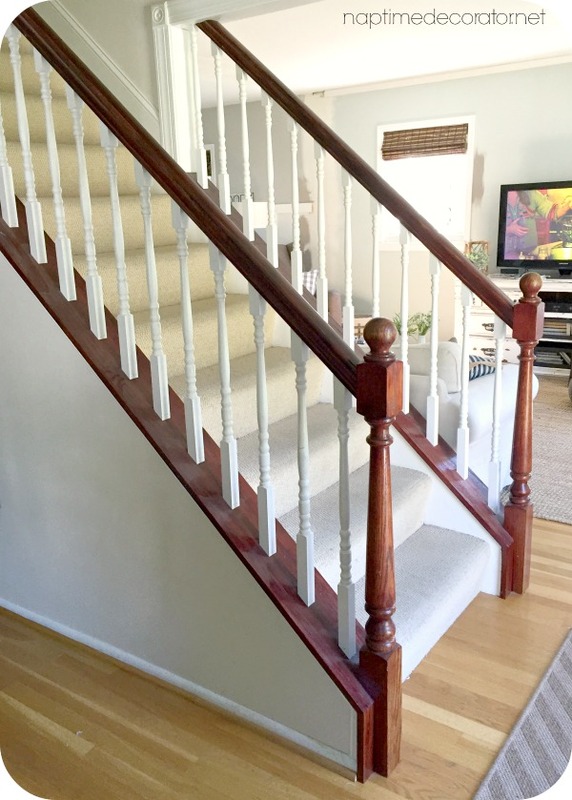 But sometimes I just get too excited and would rather clean up at the end that take the time to prep in the beginning;) But I also knew that our spindles needed a paint job something awful, so I didn’t care about getting stain on them. (You can see in this pic the nail holes that we never even filled!). Worked like a charm. Then I painted the rest of the spindles too, to freshen them up, but they were already white so it was no biggie. I am blown away at how easy this was. If you give this a go – here are a few things to know: There’s a full day of dry time involved – so be careful about that. We all kept grabbing the banister out of habit;) You don’t realize how much you hold onto that thing until you’re not supposed to! It’s not like it’s super wet, but it does stay kinda tacky for about 24 hours. So maybe do it in the morning and spend the rest of the day elsewhere! Also, it’s stinky, so it’s great to do on a beautiful day when you can open up all the windows. I only did one coat, and I had read a lot of blogs that needed two – but maybe it had to do with my darker stain to begin with. The ones I read about were a lot of light oak banisters. When you open it up, don’t expect to see a watery stain consistency – this stuff is thick – think chocolate pudding:) And a little goes a really long way. I bought a pint and barely made a dent in it. Really, the only thing I worried about was making sure there weren’t any major globs anywhere, that was about it. The rest was smooth sailing. I didn’t put anything over it – just the gel stain and that was it. I’ll do a follow-up months from now to let you all know how it’s holding up, but this seems like it’ll hold up great…we shall see. My banisters have paint on them do you think I would have to strip them down? I wouldn’t think it would work over paint, but I can’t say for sure – maybe test an inconspicuous spot?! I just LOVE this look! So fresh and the black/white looks perfect with your colors! It really does transform the whole look of your entry and I love how you numbered your stairs, which i think was a project from awhile ago but the black bannister really brings out the numbers! As always you did a fantastic job! Thanks so much, Lynn! You’re right – those numbers were one of my very first projects;) Good eye! This turned out awesome! What a great way to freshen up your space! 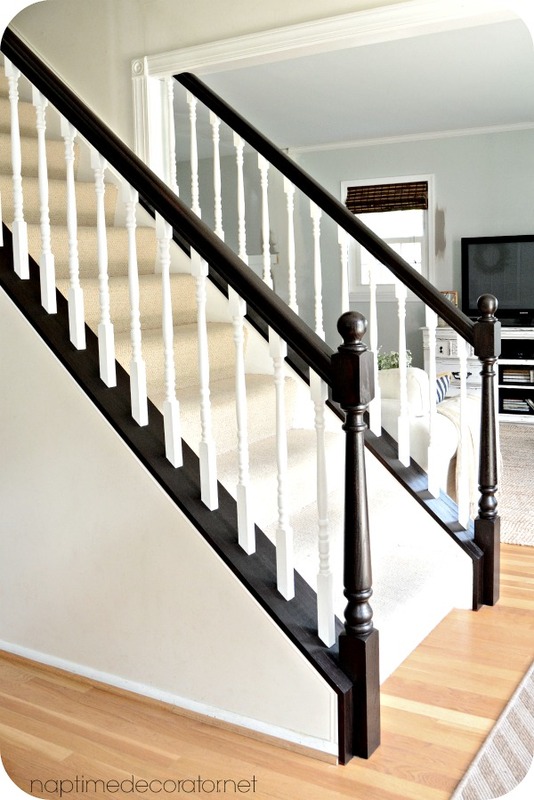 We have white painted banister and rails. Will this work the same over paint or just stain? I would think only stain, but I don’t know for sure. Maybe you could do black paint to get the same effect?! I love it. I have a closed in stairway with just a rail, but I’m going to try this out right away. Thank you for sharing. Love this look. Do you think this would work for a kitchen table as well? Thanks! I don’t see why not?! I would imagine, but can’t say for sure! Maybe Google it? I’ve used it in a table before and it turned out perfectly. Is the color black or an express color? I have black kitchen chairs. They are marred from grandbabies booster seats. Do you think this would bring them back to life? It’s a deep espresso – not quite black, but close. This is not quite black – it’s a deep espresso color. Might do the trick with a couple coats, I can’t tell you for sure though! This looks amazing! I have a few cheap benches I picked up for our new/longer/fancy dining table but the stain on them is all wrong (but the price was right!) I’d planned on trying to strip and restain them, but this might be even easier (because I’m so lazy and I HATE sanding prep!) Thanks so much for sharing! Hi. This is Beth (your neighbor l, Allison’s friend). I didn’t realize the stain was not water soluble. I went to wash out the brush and what a mess. Luckily I had terpentine. It looks great but I think I need a second coat. Also, I was wondering if you decided to seal it? Or is it holding up ok? Thanks. Sorry for the typo. I’m Allison’s co-worker. Hi Beth! I didn’t realize that either – I just used a cheap foam brush and threw it out. I didn’t seal it and it’s holding up perfectly – no issues at all! This looks beautiful! After thinking about this for awhile and doing some research, I’m going to be brave and tackle this project. I have yellowed oak banisters and can’t stand to look at them for even one more week. Thanks for sharing your project, it looks beautiful. Wish me luck. where did you buy the product from. so beautiful! 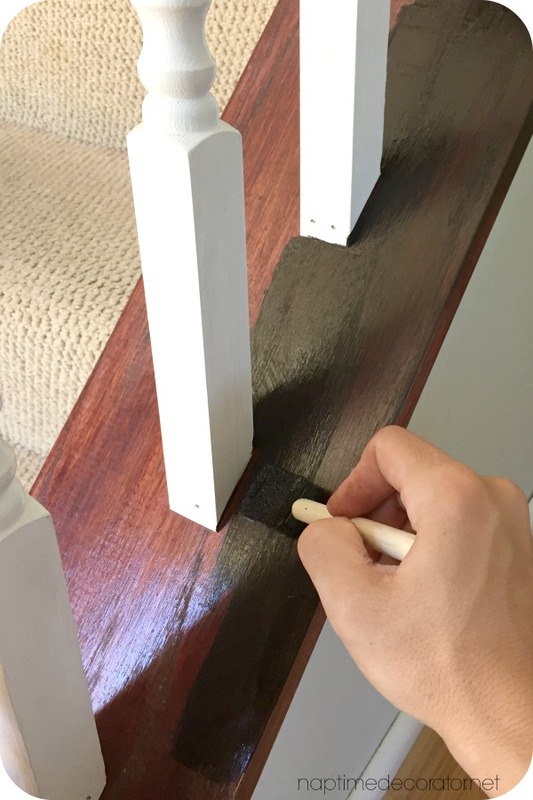 we are buying a new handrail, and i want it to be nice and dark but my hubs doesn’t want paint… so I think I’ll do a gel stain. It looks like you didn’t wipe it off–you just did a nice even coat and left it to dry, correct? Thanks, Rebecca! Yep, you got it! This General finish gel stain is also sold in black. Would you recommend that? Never seen it used before, so I can’t say for certain – but if you like black, I would think it would look nice! This is exactly what I have been wanting to do to my stairs for years. I just retired and this is going to be my first DIY project. Thanks for posting this information. I cant wait to order this stain and get started. Wow. This is the second time I have seen these and wow. They look incredible. It also made the carpet on your stairs look whiter or is it just me? Where you can look at the before and after at the same time I noticed it. Looks amazing!! 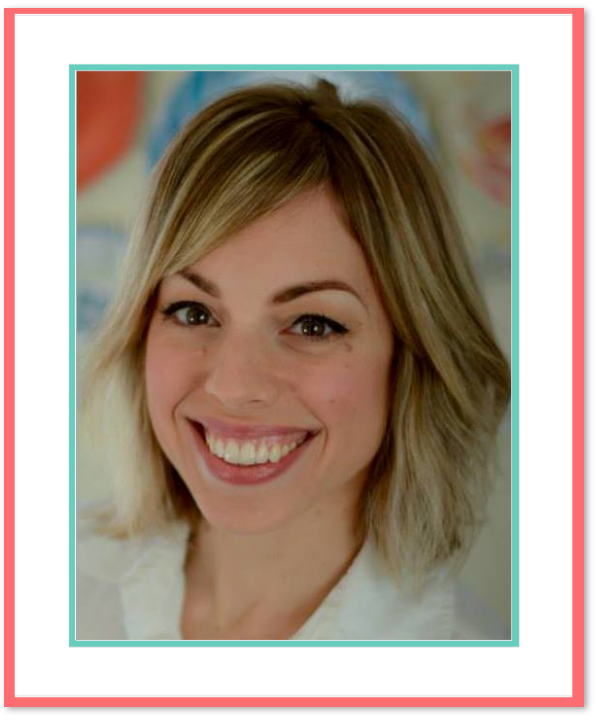 Thank you so much, Stacy! Hi there, I am about to tackle this project. One question- I have a split entry and my fireplace in the living room is a darker brown mantle that you see as soon as you go up the stairs. Should I match the dark brown for my stairs with the mantle or can I do the black? No need to match – Might make it more interesting if they don’t! To get yours that deep dark color did you wipe the stain off after applying or did you just let it stay? If you wiped it down after application how long did you wait? I’m practicing on a scrap piece and it just keeps wiping off to a very slightly darker color but no where near the color you achieved. Tips? Wipe vs no wipe? Thanks and I hope mine turns out half as good as yours!! Hi Angela! Nope, no wiping. Good luck! Hi, I am just trying this for the first time. It has been a little tricky and I am not feeling too confident about it but in your pictures the finished look looks shiny where as mine are looking dull. Did you ever put a finish/top coat on over the stain? Also have you every tried chalk paint and what would be the difference between chalk paint vs gel stain (Although it is really too late for me I did put the stain on, I am on my third coat, but someone said I “should have” done that, so just wondering. Thanks! Hi Kirsten. Gel stain and Chalk piant are two totally different products. Gel stain is oil based. It’s a stain. It penetrates into the wood but not as much as a more watery oil based stain like Minwax. 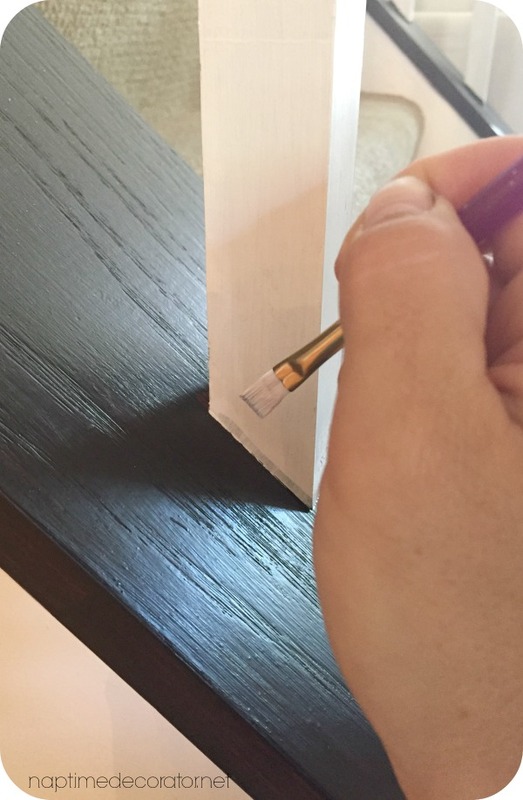 The gel stain will rub off over time if you don’t apply a clear-coat over it. Chalk paint on the other hand is a paint that sits on top of the wood. It’s thick and has a very matte finish. You’d need several coats to cover this railing. I also suggest a clear coat over Chalk Paint. Beautiful job on the railings! I have read that even though the gel stain has a bit of of sheen to it, you do still have to use a clear coat or it will rub off over time. General Finishes top coats are great, but since this is an oil-based product, I like to use Minwax Wipe-on Satin Poly. you can apply it with a rag so it won’t drip. Wow, absolutely beautiful! You remind me of myself. I get so excited to start a project I jump right in without prepping anything and just clean it up after. Thanks for sharing! My stairs are one of the last projects I need to do in my dining living area and I have been so reluctant to start because of how hard I anticipated it would be with all that shiny poly on he wood. Now after reading your post I have a “I can do this” feeling! . Thanks again. Thanks, Londi! This makes me so happy:) Good luck – hope you love them as much as I do! Did you apply a top coat to seal? 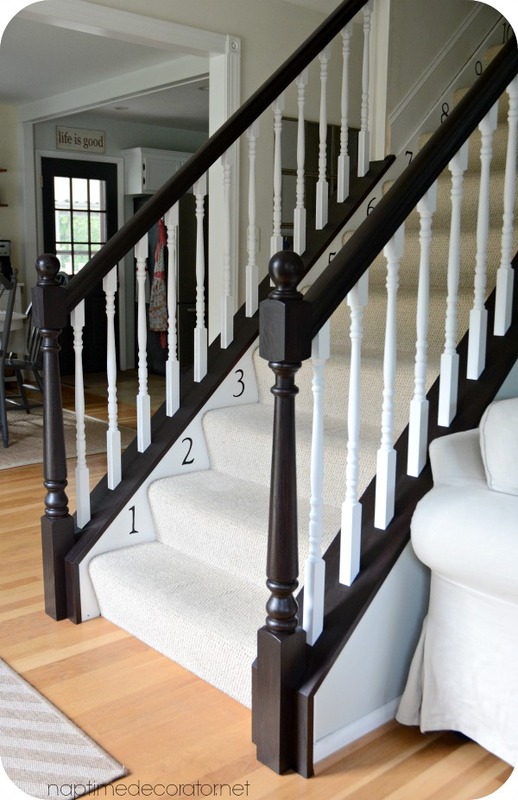 Also, for spindles, did you use glossy white trim? I love your stairs & feeling inspired. I’m glad I found this post, and thank you for sharing!. 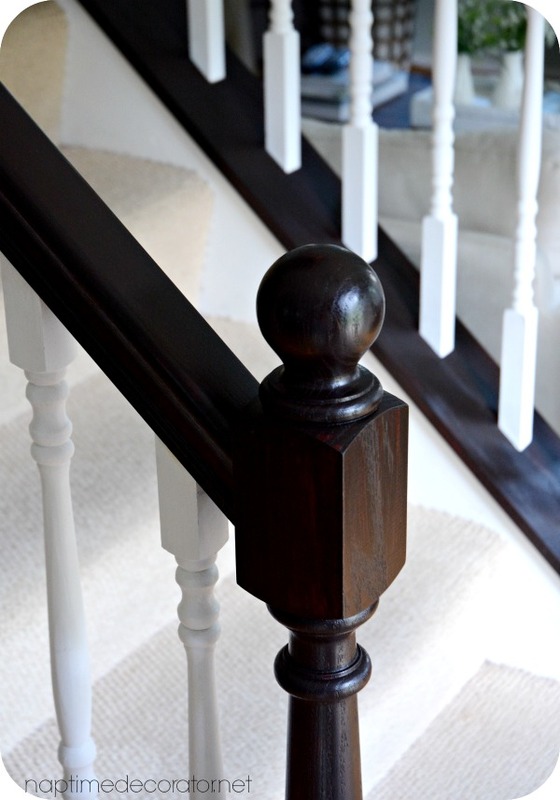 I have VERY similar banisters and spindles and stain color. Ugh. It’s a beautiful house, but I want darker wood, and this product is something sold at a chalk paint and paint products store in Norcross, GA so I can get it there. Knowing I don’t need to worry about wiping it back is HUGE. 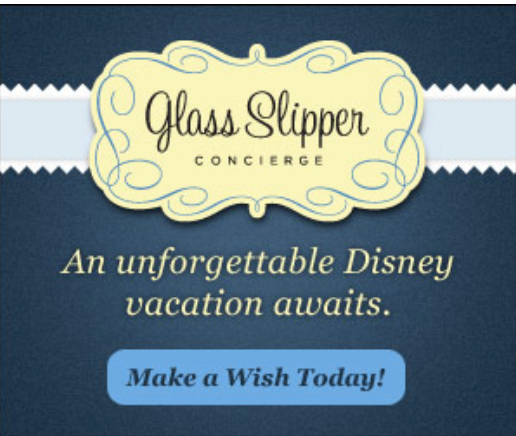 This would be a great time-saving option until we’re ready to completely replace it all with wrought iron. I wish I knew if this would work on the wood flooring, also. Our wood flooring is very reddish and I hate it. Any update as to how it’s holding up? Pics? It’s holding up great – I’ll take some pics and post in a blog soon! I am going to try this as well. Also, 2 years ago i painted all my kitchen cabinets with this stain, and they are holding up perfect!! Totally changed the look of my kitchen! Looks Amazing!Was this the oil base or regular Java? Can this be used on the treads also? Hmmm…good question. Not really sure, sorry! I’ve used GF gel stain a TON (including recently restaining my entire kitchen – omg) and love it so much, I would marry it if I could. My next project is my stair rail, which is how I found your great post. JFYI: REALLY have to do at least 1 coat of poly over the top. Ideally 2-3. The word “stain” is kind of a misnomer with this stuff, as it’s actually pigment that sits on top of the surface, and does not seep into it. So it will scuff and scratch for shizzle if you don’t protect it. I like GF water based poly. Goes on easy, dries awesome. Have to wait 72 hrs after applying gel stain, however, because the stain is oil based. Water based topcoat requires that oil base is suuuuper dry before slapping on the topcoat. Yours looks beautiful and the stain went on so evenly. I am right in the process of using the Java gel stain on our oak bannisters and trim and I’m having a terrible time with it. I made sure to properly prep everything: sanded and used mineral spirits to clean the wood. The stain seemed to go on streaky but I waited a few minutes before wiping down the stain with a clean cloth. Even a couple of minutes was too long though because it was already drying and super sticky. I ended up having to use mineral spirits to take it off and now there are light and dark areas. Arghh! I was using a foam brush too but no way does mine look as good as yours. I’m pretty frustrated right now and taking a break from it. This was not as easy as it looked in any of the tutorials I have watched. I also have a feeling it’s something I’m doing vs. the product. I was super careful and meticulous about prepping the wood and that alone took me a week!! So I don’t know what to think. Wish me luck!! I sometimes hang damp comforters and blankets over my railings to dry. Do you think this Stain would come off on my comforters if I continue to do that after I staining it? 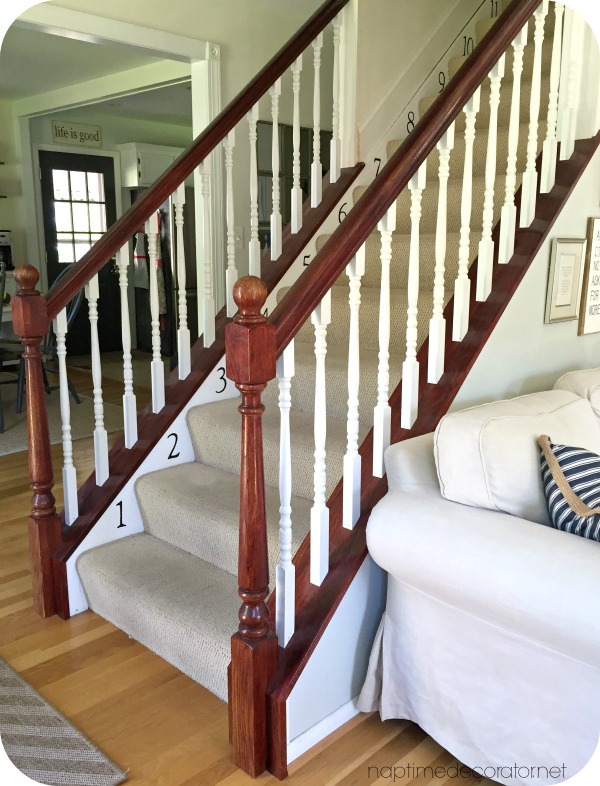 What white paint did you use for the spindles? I used whatever white we had in our stash – can’t remember, sorry!! Might’ve been a sample of Sherwin Williams Alabaster. It looks awesome! Do you think I can use the same product on the steps? Did you put on a coat and wipe it off before applying the next coat??? I tried this and it didn’t get darker despite multiple coats….. wondering if I missed a step somewhere?? I didn’t? That’s weird, sorry you had issues with it! I used Java gel stain on a solid wood floor, I watched lots of yourube videos and found that you paint it on then wipe it off then recoat .what did you use to wipe off the gel between the coats please? I didn’t do any wiping off between coats, sorry! Did you use a brush, sponge to paint on the gel? I just started my banisters today and used a sponge brush but thinking a paint brush may work better? I am not a painter by any means, however I did my bathroom vanity with General last week and it came out beautiful. What is your opinion? I didn’t sand just cleaned it with what they recommended at the paint store. Not much top coat left on them after 30 years. Looks great so far. Thanks for sharing. Hi Denise! I just used a small foam brush. I didn’t clean the banister, but just lightly sanded it and then wiped the dust off and used the brush. It’s held up beautifully! Hi, I am going to do my banister tomorrow. What about the smell? Its very strong. Also, I have a small wood foyer floor. maybe 10X10. Can I use it on that to match the banister? 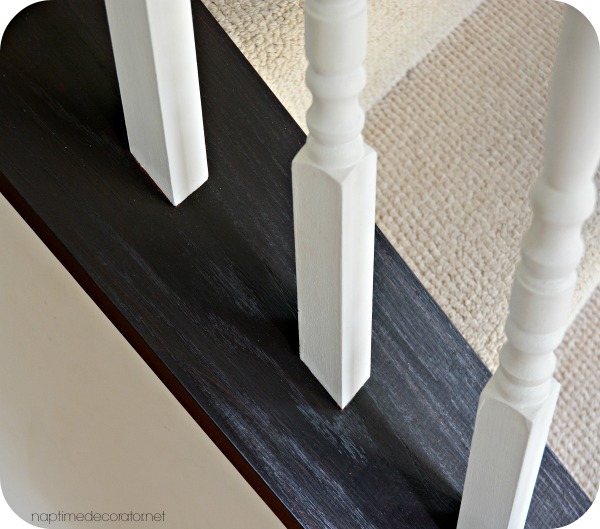 Have you ever thought about painting the spindles the same Java color? 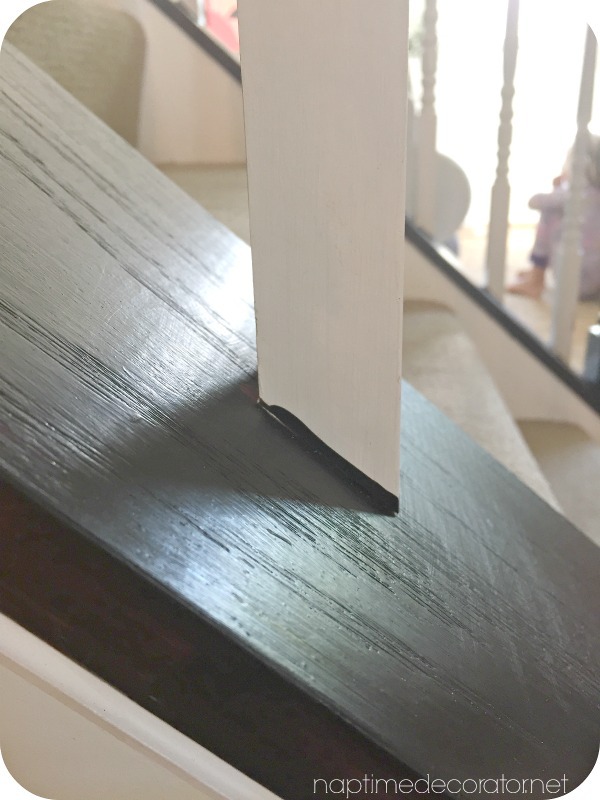 I stained my stairs a java like color about 3 years ago and the stain is coming off..looking to do them over but wanted to do a more dark maple rustic look…do you think the gel stain will cover it after loght sanding? Or will i have to sand the previous completely? I loved that there was not mich prep because that was the worst part the first time! Thanks for your help. Looks amazing! I’ve used gel stain before like a paint, but I know that you are supposed to paint it on, then wipe it off so that it isn’t gunky. Did you apply it like that? I haven’t done it that way. 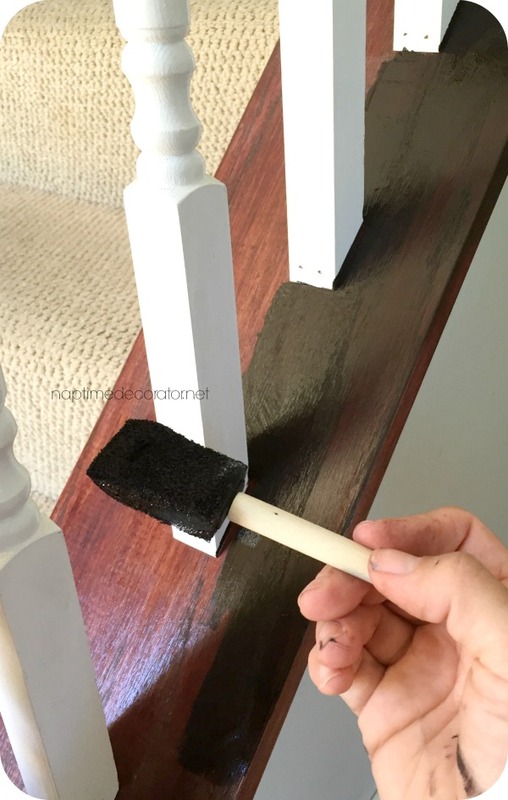 I’m dying to redo my banisters and debating on GF lamp black or java gel. Thanks you! I’m about to start this project on my banister! I wanted to ask how did you do your end posts with the groves did you use that same foam brush? Also when you painted the stain on did you wipe it as you would when staining a flat surface?